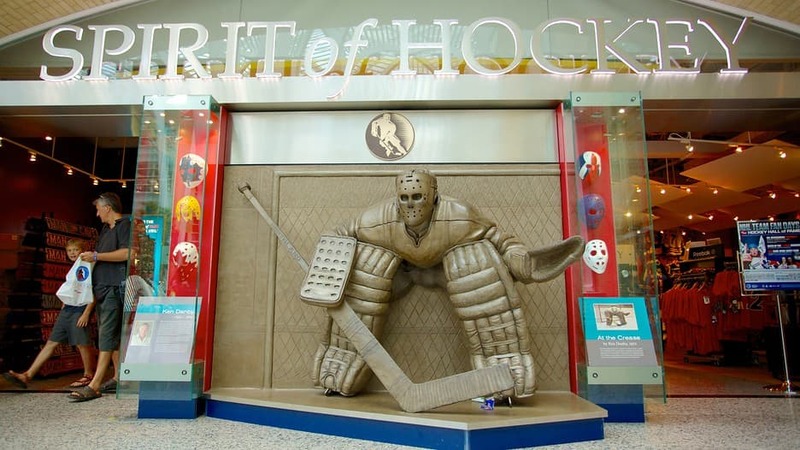 We don’t want to say it’s sacrilegious to go on vacation in Canada without visiting one of the top hockey arenas, but…it kind of is, amirite? Locals and visitors alike come together at professional hockey games to hoot, holler, and soak up the frenetic energy of a world-class arena. It’s almost like you’re breaking bread with strangers, except you’re bound to witness more broken bones than fractured carbs. Whether you’re aiming to get the best fan experience or set eyes on the most unique venue, we’ve rated the best arena features that will have you buying an authentic jersey at intermission. The Air Canada Centre brings the spirit of Toronto into the arena, and it provides the best neighbourhood experience of just about any hockey venue. Your fun will begin on the subway or GO train; a few stops from the rink, if you yell out “Go Leafs!” you’re bound to make some new best friends. Arrive to the arena’s ‘hood early, so you can sink your teeth into some specialty mac and cheese at MacCheesey’s or next-level poutine at Smoke’s Poutinerie before the game. Reserve some time for a stop in Maple Leaf Square, where you can mingle with throngs of fellow fans and grab a pint at Real Sports Bar and Grill, which has more TV screens than staff (can you say pre-game coverage?). Game time has almost arrived, and that can only mean one thing: It’s time to head to the Ice Box on the arena’s upper level. Grab a drink or some pre-game snacks while you watch warm-ups. Don’t worry, if you get hungry at intermission, you can head to the Union Market. The concession area has delicacies that reflect neighbourhoods in Toronto. When the last buzzer screeches, take advantage of the arena’s central downtown location. The Hockey Hall of Fame, CN Tower, and Harbourfront are all within walking distance. The Scotiabank Saddledome is not only the most unique arena in Canada, it may also be one of the most recognizable venues in the world. The building itself is shaped like a saddle, reflecting Calgary’s mounted heritage. Though, to be honest, the architecture is still really fun without context. As if its shape wasn’t special enough, the arena has managed to sell out every Flames game since the 2005-06 season. You won’t find more loyal fans anywhere! This western-inspired venue is located on the Stampede Grounds (where else? ), and is conveniently near “The Red Mile,” named for the Flames’ 2004 playoff run. It’s here that you’ll find a healthy collection of bars and clubs serving up pre-game drinks. 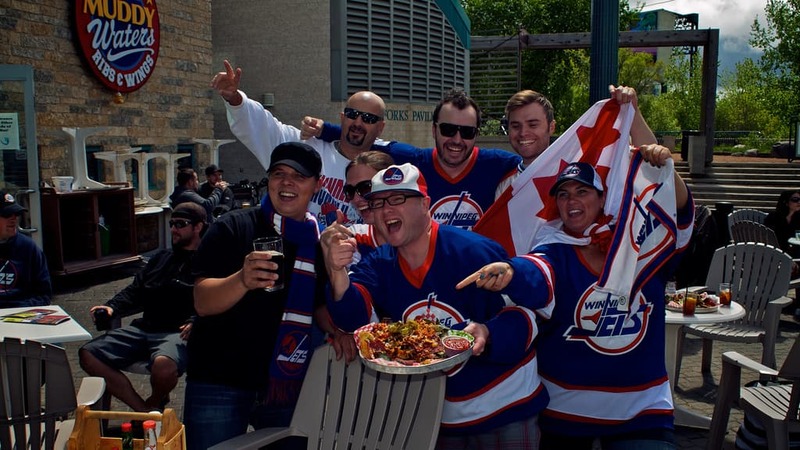 Stop by the Ship and Anchor Pub, where you can mingle with rabid Flames fans of every ilk. Once you’re at the arena, order a glass of heroin beer. Sure, myths about its potent nature have been debunked, but some locals still swear it’s the strongest draft you’ll ever sample. The walls of the Saddledome are practically wallpapered with memorabilia and trophies, giving you no reason to be bored at intermission. Oh, and you’re not allowed to leave the stadium without trying a pocket dawg, which is a hot dog inside a baguette. Ok, you don’t have to try it… but you only live once, just remember that. 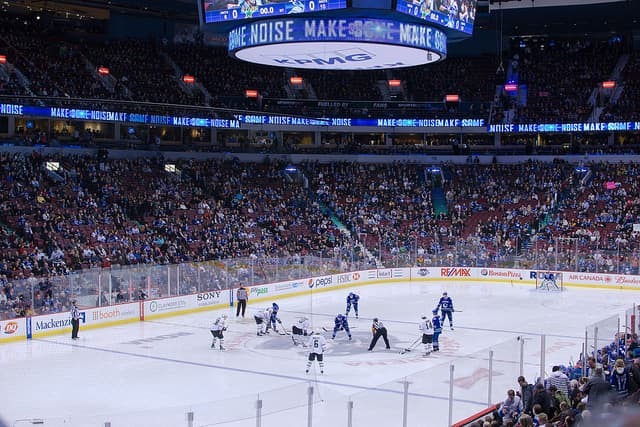 Lots of Canadian hockey arenas boast accessibility, but Rogers Arena might just be the most convenient of them all. If you’re driving to the game, take advantage of the underground parkade or one of the other many lots within a 15-minute stroll. The Skytrain Stadium-Chinatown station is just a one-minute walk away, and is a great way to arrive (and get home) if you plan on doing some good old-fashioned game-time drinking. Want to feast before the first puck hits the ice? Tons of Vancouver eateries are within a 10-minute walk or less. Grab a burger or pizza at Yaletown Brewing Co. or get in the spirit at Red Card Sports Bar. You’re in your seat at the stadium (even nosebleeds offer a stellar view) and the game is about to begin. But not before singer Mark Donnelly belts out the first verse of “O Canada” and then extends his mic so that all 17,000 fans can sing the following verse. On-ice projections and LED in the glass also make the arena special and the views easy. 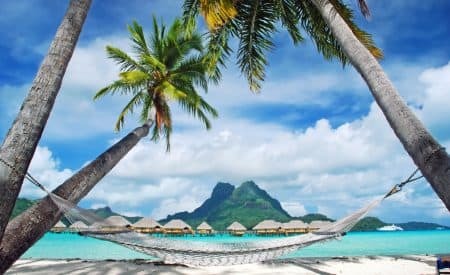 Need a place to crash after the final quarter? Head to the Rosedale on Robson hotel, which is a convenient 10-minute walk away. 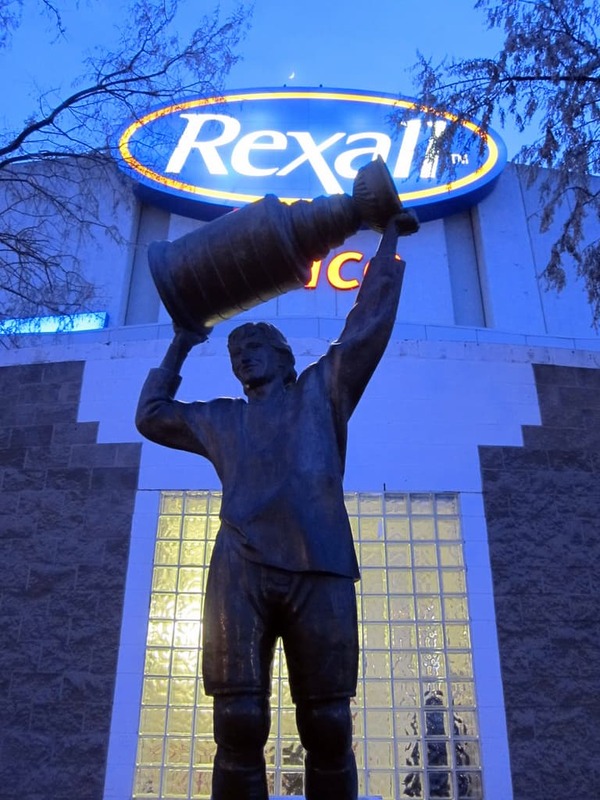 As the oldest NHL arena in Canada, Rexall Place is an important landmark in Alberta. Plenty of championships have been won here—they don’t call Edmonton the “City of Champions” for nothing. Aside from being the most historic arena on the Canadian landscape, the venue also has some of the cheapest beer and food prices of any major NHL arena. You’ll pass a huge statue of the Great One (Wayne Gretzky, of course) as you enter the venue, which is bound to bring the team some good luck. Don’t forget to order a pierogi dumpling in the stadium, inspired by the area’s strong Ukrainian heritage. When the team comes out onto the ice, they skate through a 30-foot oil derrick, just another reason the arena is unique. Honour the 1980s-era team that was given dynasty status by the Hockey Hall of Fame with a visit to their home base. The 2015-2016 season will be last year the Oilers play in Rexall Place, so experience your favourite team playing in this historic arena while you can! When visiting Edmonton for a game be sure to check out what else the city has to offer like the historic Old Strathcona district and the largest mall in North America. Now, you’ll have a whale of a good time at any Canadian hockey game, but MTS Centre provides arguably the best fan experience in the entire league. The atmosphere, between the fans and the food, is difficult to rival. If you’re into pre-game shenanigans (and who isn’t? ), stop by the Exchange Restaurant and Beer Market. The restaurant opens 90 minutes before the first puck drops. The Tavern United sports bar is another great meeting spot; it sits just next to the arena and has a roof-top happy hour. Once game time arrives, prepare your ears and your nervous system for the loud and proud Jets fans, who are guaranteed to go nuts as soon as their team hits the ice. Before the anthem is even sung, enthusiastic “Go, Jets, go!” chants fill the arena. During the national anthem, fans traditionally honor True North Sports and Entertainment (the owners who brought the team to Winnipeg) by shouting out “True North” at the appropriate time in the song. If you get hungry during the game, just order up a Jumbo Jet Dog—bacon bits, chili, nacho cheese, and pierogie toppings can refuel the rowdiest fan. If you want to make a weekend holiday out of your hockey experience, there is perhaps no better place to do it than Montreal. Centre Bell, which is proud host to the Montreal Canadiens, is smack dab in the middle of the city’s thriving downtown district. Why park at the crowded arena when you can stay at a hotel nearby and walk to the game? 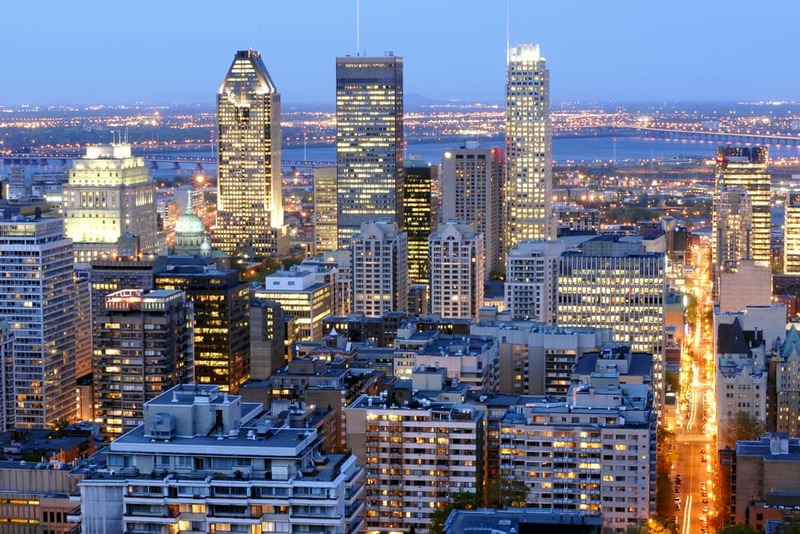 You won’t have a hard time filling a weekend in Montreal, that’s for sure. 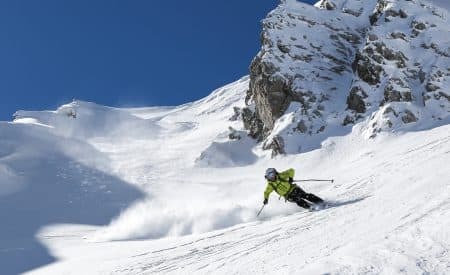 Go ahead, treat yourself to a stay at the Montreal Marriott Chateau Champlain or Hotel Le Crystal Montreal and you’ll be a stone’s throw from Centre Bell. Before you head inside for the game, stop for a paid tour of the Canadiens Hall of Fame. Then make your way around Centre Bell before finding your seat; all four levels celebrate the team’s many Stanley Cup championships. Once game time nears, the team’s intro is quite the spectacle, and fan involvement inspiring. During your weekend vacation, you can also take a tour of the entire arena, which will yield views of Stanley Cup banners and behind-the-scenes areas. Food and drink around the arena spoil you for choice: Just head to Rue Peel or Rue Crescent to see what we’re talking about! 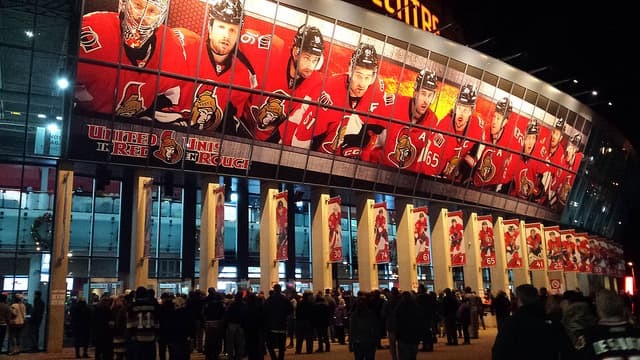 The Canadian Tire Centre is not only remarkable for its tailgating atmosphere outdoors, but also because it gives every fan the best seat in the house once they get inside. There are more than 19,000 seats, with 2,000 standing-room tickets sold during the playoffs, and you can’t go wrong! Located in the suburbs, there may not be much in the way of nearby restaurants and walkable eateries, but that just means you can mingle with fellow hockey lovers in the parking lot before the game! If you don’t want to drive, grab a $6 shuttle from downtown Ottawa—you can still tailgate your heart out. Inside, you are welcome to hang out at Bert’s, the official headquarters for the Sens Army (aka the team’s enthusiastic fan base). Once you’re at the game, pay special attention to Lyndon Slewidge, the retired Ontario Provincial Police officer who sings the pre-game national anthem. He’s been the team’s official singer since 1994 and is known for ending each performance with an endearing wink and “thumbs up.” If you get to attend a game on a Throwback Thursday, you can snack on discounted concession treats and watch the Sens play in heritage jerseys. Can you hear that? It sounds like a puck swooshing into the net. Time to buy your seats at one of Canada’s best arenas!